How is the Footprint calculated? The Ecological Footprint is an indicator of human pressure on nature. The Ecological Footprint tracks humanity’s demands on the biosphere by comparing humanity’s consumption against the Earth’s regenerative capacity, or biocapacity. 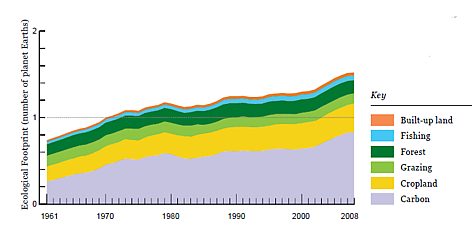 The current overshoot is largely due to carbon emissions. During the 1970s, humanity as a whole passed the point at which the annual Ecological Footprint matched the Earth’s annual biocapacity. This situation is called “ecological overshoot”, and has continued since then. An overshoot of 50% means it would take 1.5 years for the Earth to regenerate the renewable resources that people used in 2008 and absorb CO2 waste. Put another way, people used the equivalent of 1.5 planets to support their activities. CO2 and other greenhouse gas emissions from human activities are far more than ecosystems can absorb. 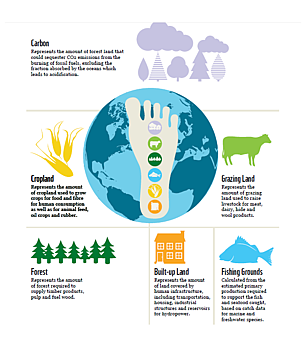 An individual’s Ecological Footprint varies significantly depending on a number of factors, including their country of residence, the quantity of goods and services they consume, the resources used and the wastes generated to provide these goods and services. If all of humanity lived like an average Indonesian, for example, only two-thirds of the planet’s biocapacity would be used; if everyone lived like an average Argentinean, humanity would demand more than half an additional planet; and if everyone lived like an average resident of the USA, a total of four Earths would be required to regenerate humanity’s annual demand on nature.